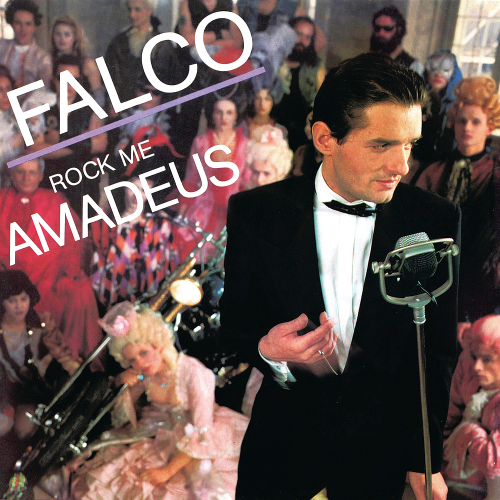 With Rock Me Amadeus, Falco became the first German-speaking artist to be credited with a number-one single in all mainstream US pop singles charts : the Billboard and Cash Box Top Singles. Prior to Falco, 99 Luftballons by Nena got to number one on Cashbox, but peaked at number two on the Billboard. Falco had already had a minor US hit with Der Kommissar, Sound of Musik which reached, and his follow-up single from Falco 3, Vienna Calling. Originally recorded in German, the song is about Wolfgang Amadeus Mozart, his popularity and his debts. A longer version, named the Salieri Mix, appeared on the initial US release of the album Falco 3. The song was inspired by the movie Amadeus. For the US release, the song was remixed with an English background overlay. There was never a full English version.